The PA has announced that the government of France recently donated 8 million euros to the "Palestinian government's 2018 general budget". [Official PA daily Al-Hayat Al-Jadida, Nov. 13, 2018]. This donation brings France's direct support to the PA's general budget to 16 million euros (67,869,600 shekels) in 2018 . The PA's "general budget" is the source from which the PA pays salaries to terrorist prisoners and released terrorist prisoners and allowances to the families of dead terrorist "Martyrs." Despite the severe criticism of the PA practice by the international community on the one hand, and the PA's constant complaints regarding its financial woes and the need for continued international monetary support on the other, the PA nonetheless allocated 1.237 billion shekels - or over 7% of the entire 2018 budget - to fund its terror rewarding practice. In other words, France's total 2018 contribution to the PA's general budget funded more than 5% of the PA's expenditure for what has been termed the PA's "Pay for Slay" program. 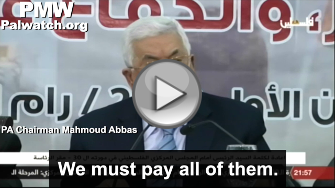 "I say this to everyone - the salaries of our Martyrs, prisoners, and wounded are a red line. They [Israel] try by all means, and exert pressure by all means, and they continue to exert: "It cannot be that you will pay." And they'll even deduct our money that's in their hands. They'll deduct from it the amount that we pay to the Martyrs. We have said that this is a red line and we will not allow [it]. From 1965 until now, this matter is sacred to us. The Martyrs and their families are sacred, [and so are] the wounded and the prisoners. We must pay all of them. If one penny remains in our hands it is for them and not for the living." 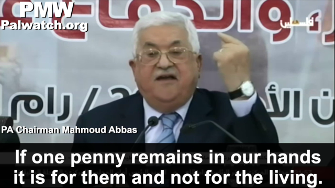 This unequivocal statement, which Abbas has repeated several times, makes the PA's priorities crystal clear: To promote, incentivize, and reward terrorism before feeding, educating, or catering to the other needs of the PA's non-terrorist population. Accordingly, it must be similarly clear to the French government that any donation it makes to the PA's general budget will go first to terrorists and their families before civilian needs. While French officials may try to deceive themselves that their specific euros do not fund the PA's "Pay for Slay" program, the French government must recognize that the 293 million euros the PA pays to terrorists and their families in 2018 is drawn from the same general budget enriched with 16 million French euros. Moreover, it is important to note that any foreign donation to the PA - general budget or otherwise - which fails to condition the funding on the PA ceasing to reward terror, legitimizes this PA practice. Accordingly, Palestinian Media Watch is calling on the French government to immediately stop putting money in the terror financing PA general budget and to consider adopting legislation - as other donor countries have done - that would condition all of France's aid to the PA on the latter abolishing its practice that squanders more than 7% of its budget on rewarding terror. Headline: "Bishara signs an agreement with the French consul on budgetary support of eight million euros"
The ministry explained in a statement that the government of France allots an annual sum of 16 million euros for support of the Palestinian budget. Minister Bishara expressed joy and pride over the signing of the agreement, and expressed appreciation for the French government's great efforts to support the Palestinian government. Minister Bishara praised the French support... as it deals with support for many important sectors such as the water supply, energy, the private sector - where the government of France gives loans and grants for the development of private Palestinian companies - and the education sector."